Allan A. White, 86, of Schuyler, died Saturday, April 7, 2018 at St. Joseph’s Villa in David City. Allan’s wish was to be cremated, and no services will be held. Allan A. White was born June 11, 1931 in Schuyler, Nebraska to Clarence Sr. and Anna (Cuda) White. 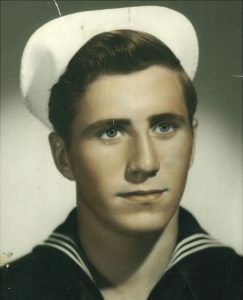 He attended school in Schuyler and joined the United States Navy at the age of 16. On August 20, 1955, Allan was united in marriage to Marilyn Vuylsteke in Portland, Oregon. Three children were born to this union. Allan served 20 years in the Navy, serving as a Boilerman first class, retiring in 1967. After retiring from the Navy he worked at the Shriners Hospital. He is survived by his wife of 62 years, Marilyn of Schuyler, Daughters and sons-in-law Katherine Ann (Jerry) Mathison of Portland, OR, Linda Louise (Butch) Childs of Seaside, OR, son Allan A. White, II of Wilsonville, OR. Three grandchildren. Brothers Clarence of Schuyler, Leonard of Arizona, Robert of California, Richard of Oregon, Gary of Washington and Larry of Oregon. Sisters Karen Zrust of Bruno, Darlene Booth of Neligh. He was preceded in death by his parents, brothers Wilfred, Walter and Charlie. Sisters Clara and Gloria.